As Plan Administrator, you can determine what types of hardship withdrawals — if any — are allowed from your plan by checking the adoption agreement. In general, hardship withdrawals may be allowed from profit sharing plans and profit sharing plans with 401(k) features. There are two types of hardship withdrawals: 401(k) and non-401(k). Check your adoption agreement to see if either or both hardship withdrawal types are allowed by your plan. The 401(k) hardship withdrawals apply only to 401(k) source contributions (including Roth 401(k) contributions), and not to earnings credited to the participant’s account after the last day of the last plan year ending before July 1, 1989. The non-401(k) hardship withdrawals apply only to employer profit sharing (source F) and employer matching contributions (source D) and only if the participant is 100% vested in these contributions. See the Contributions section for more details on contribution types. Both types of hardship withdrawals may be requested by an active participant if he or she has a financial hardship and must satisfy an immediate and heavy financial need. Expenses to repair damages to the participant’s primary home that would qualify as a casualty deduction under Section 165 of the Internal Revenue Code (effective 1/1/18, “casualty deduction” only applies to damages that occurred as a result of a federally declared disaster). *The primary beneficiary under the plan is the individual who has an unconditional right to all or a portion of the participant’s account balance upon his or her death. Because hardship withdrawals can only be approved by the Plan Administrator, you will need to keep on file the applicable documentation (e.g., purchase and sales agreement, foreclosure notice) in the event your plan is audited. Active participants can withdraw only the amount needed to meet the financial hardship (including the estimated taxes payable on the hardship withdrawal). Participants must specify the investment options and the amount or percentage to be taken from each option, unless the withdrawal is for the entire account. If no instructions are given, the withdrawal will be made pro-rata from all of the available investment options. Also, the amount is subject to any applicable taxes, IRS early withdrawal penalties and withdrawal restrictions (for example, no withdrawals are allowed from the SDBA without first liquidating assets and transferring the necessary amount to the Program’s investment options). For 401(k) hardship withdrawals, federal law does not allow withdrawals of earnings credited after the last day of the last plan year ending before July 1, 1989 on participant pre-tax elective contributions or Roth 401(k) contributions. If a non-401(k) hardship withdrawal is requested, have taken all available after-tax withdrawals if there are after-tax contributions in the account. Participants receiving 401(k) hardship withdrawals will be suspended from making 401(k), Roth 401(k) and post-tax contributions to the plan for six months after receiving the withdrawal. 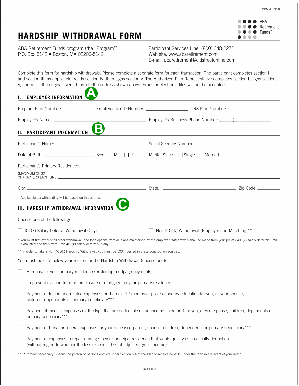 If the participant is eligible for a withdrawal, give him or her a Hardship Withdrawal Form along with a “Special Tax Notice Regarding Plan Payments” and a “Notice of Benefits and Benefit Payment Form” (attached to the Hardship Withdrawal Form). If the participant is requesting no withholding, Form W-4P should also be submitted to the Program. Form W-4P can be obtained through the IRS website at www.irs.gov. Participants can request a hardship withdrawal by completing Hardship Withdrawal Form. The participant must complete Hardship Withdrawal Form. 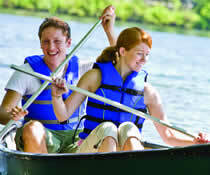 The participant may also complete Form W-4P to request no withholding. (If Form W-4P is not submitted, the Program will withhold federal income taxes from the withdrawal at a flat 10% rate.) The participant then gives the signed Hardship Withdrawal Form (along with Form W-4P, if applicable) to you. • Type of hardship withdrawal. • Reason for financial hardship. • Investment funds the withdrawal will be coming from. • Dollar amount or percentage of withdrawal. • The participant provides supporting documentation to you. 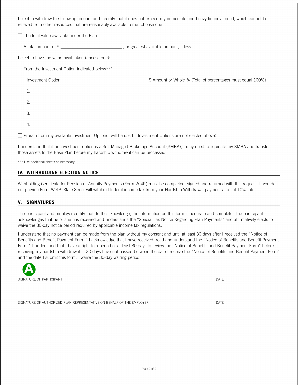 A.The participant must sign and date the Form. Then the participant sends it to the Authorized Plan Representative for signature. Once you receive the participant’s completed form, and Form W-4P (if applicable), you must review and sign it as the Authorized Plan Representative. Submit the completed Hardship Withdrawal Form to the Program using one of the methods described under “Mail & Email” in the Forms, Tools and Resources section of the Guide or to the address on the form. Once the Program receives the properly completed and signed Hardship Withdrawal Form, the hardship withdrawal is processed and a check (with a confirmation statement attached) is issued within two business days. Hardship withdrawal checks are sent via overnight delivery to the participant at the firm. In January of the next calendar year, the Program will mail the participant an IRS Form 1099-R regarding any taxable withdrawals for the prior tax year. Any withdrawals processed by the close of business on the last business day of the quarter will be reflected on the participant’s quarterly statement. Quarterly statements are mailed no later than 10 business days after the end of each quarter.